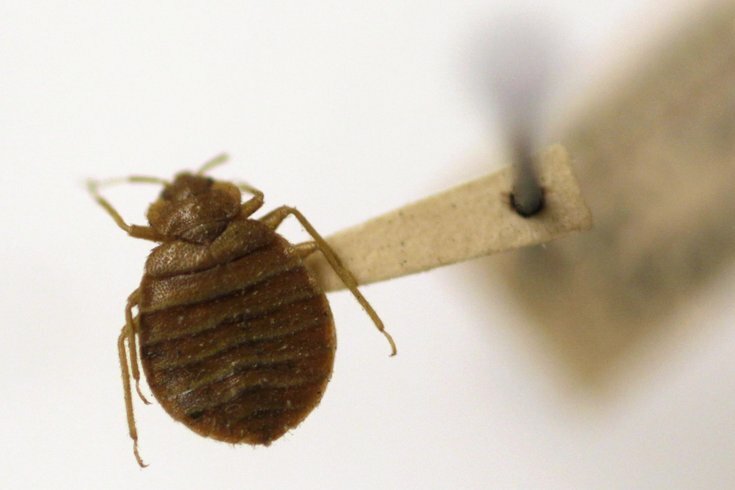 In this Wednesday, March 30, 2011, file photo, a bed bug is displayed at the Smithsonian Institution's National Museum of Natural History in Washington, D.C.
Pest control company Terminix has released its 2018 top 25 list of cities most affected by bed bugs, and unfortunately, but perhaps not surprisingly, Philly is topping the list. We come only second to Cleveland, where residents reported the highest number of bed-bug control services this year. Pittsburgh also managed to get on the list, coming in at No. 22. To make this year's list, Terminix apparently collected data from more than 300 pest control branches across the country between October 2017 to September 2018 in order to determine which cities had the highest number of recorded complaints. The Environmental Protection Agency identifies bed bugs as "public health pests," and a 2014 study by Penn Medicine found they can transmit the parasite that causes chagas disease to people they bite. In 2002 they were added to the EPA's "Lists of Pests of Significant Public Health Importance" next to gross nuisances like lice, cockroaches, mice, and mosquitoes. Like most major cities with a bed bug issue, it's a struggle — and expensive — to eliminate the pests. But in Philly, not much has been done to try and tackle it, despite overwhelming evidence that we have a problem. In 2013, a task force was formed in an attempt to make recommendations and pass legislation on the enforcement, but nothing came of it. If you're dealing with a bed bug situation in your home, Terminix recommends laundering clothing and belongings to try and kill off the pests with high water temperatures, and keep items that possibly are contaminated in a plastic bag to prevent the insects from spreading. Although you should precautions, experts recommend getting professional help in eliminating a serious bed bug problem. Orkin also has a pretty detailed guide on how to spot bed bugs and then how to monitor them moving forward. The EPA also has some handy tips about how to prevent and control the pests.